To celebrate the 50th anniversary of the groundbreaking El Primero movement, Zenith has issued a commemorative set comprising three watches in vintage, classic and futuristic styles. In 1969, Zenith released a movement that was not only one of the first automatic chronographs but also boasted a high frequency of 36,000 vibrations/hour for a chronometer-certified accuracy of 1/10th of a second. It was the most precise high-beat chronograph then – and continues to rank today as the most precise series-made chronograph. 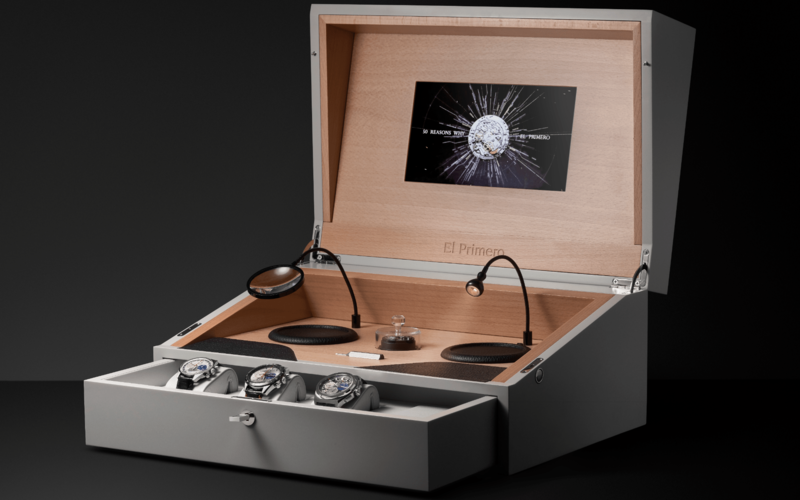 The Swiss manufacture celebrates the revolutionary accomplishment’s golden anniversary with a limited edition box set that looks back on El Primero’s evolution in the last half century. Using laser-scanning technology on a museum piece, Zenith has reproduced an exact copy of the original El Primero watch, from the 38mm steel case and the tri-colour counters to the shape of the lugs and mushroom pushers. The date aperture appears between ‘4’ and ‘5’, just like the original. The difference is the calibre, which is the current version of the El Primero column-wheel chronograph movement. Like its predecessor, it beats at 36,000vph, delivers a 1/10th of a second precision as well as a power reserve of 50 hours. Unlike the original with its closed caseback, however, the watch comes with a transparent caseback for a view of the movement. Directly descended from El Primero, the El Primero 3600 was redesigned for better efficiency, boasting 10 hours more power reserve than its predecessor. The central chronograph hand in red shows off its 1/10th of a second precision by making one complete turn on the dial in 10 seconds as indicated by the scale on the bezel. Aesthetically, it is decidedly sporty – 42mm steel case, black ceramic bezel, silver-tone sunray dial with the chronograph counters in blue, grey and silver, faceted hour markers and hands, as well as a black strap with red stitching. Showing the way to the future is this amped up El Primero movement that takes precision to its most extreme, beating 360,000 times per hour, 10 times higher than the original movement. Thus, it can measure and display a precision of 1/100th of a second, which translates into the central chronograph hand making a complete turn on the dial in one second! Housed in a Defy model, the case is 44mm titanium with the openworked dial partly covered by the chronograph counters. These magnificent sport watches are presented in a handsome satin-brushed grey box. The lid opens up to reveal a miniature watchmaker’s workbench. Below this is a drawer that holds the watches. More interestingly, it also comes with an invitation to visit Zenith’s manufacture in Le Locle and a chance to hand-stamp two coupling-wheel bridges, one for the owner to take home and the other to be placed as a historical testimony on the entrance wall of the attic where watchmaker Charles Vermot stored the components essential to the production of the El Primero at the height of the quartz crisis. The coupling-wheel bridge is one of the emblematic components of the El Primero movement.